Daryn Collie (aka Darraby) had just dropped off a relative on the way back from the airport. He let them know he was heading straight to his Oklahoma home, as he had to work the next day. He never made it. Local furs made calls, but his cell phone was not receiving them. Family gained access to his email and contacted the email addresses on that list. As of this date no-one has heard anything of him. Daryn's orange 2007 Dodge Nitro with Oklahoma plates 038KCM was found in the Mount Hood National Forest in Oregon. He may have planned this, but police are treating it as an abduction. Seeing the long travel involved, detectives have subpoenaed his financial records. 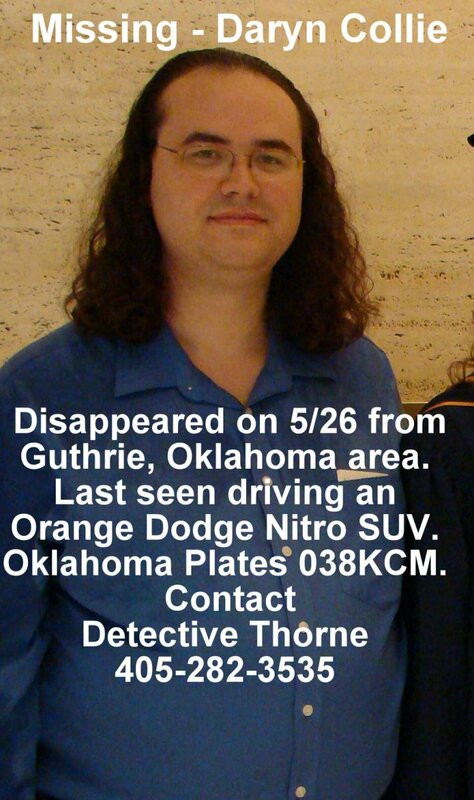 If you have any information, please contact the officer in charge, from Guthrie, OK: Detective Thorne (405-282-3535). It is believed Darraby knows furs in Oregon and Washington, so please share this information; hopefully someone can provide more information. Further details are on Facebook, Websleuths and The Oregonian. Oh Jesus, I hope he's okay. Hope they find him alive and unharmed. Best of luck for him. Does he have a real name? Collie is his real last name, that threw off someone on the Facebook comments too. His name doesn't ring a bell, I haven't heard anyone talking about him in the Portland, Oregon area. A local posted this link in our forum groups, so hopefully someone comes up with some information. Oregon has a few crazies, but for the most part, everyone in our community is level headed and responsible. My best wishes to him. I hope he is found safe and well. New information suggests Daryn/Darraby's fursona is a Tiger named PULSE. Please continue to share this information, as his family is becoming increasingly concerned for his well being. Can you show where this info is found? Just having that fursona, species and a name that does not seem to link up to anything (on FA at least) does not seem to be credible info. Sorry, not familiar with the furry world. What does FA mean? The information that his fursona name is Pulse came from a friend of his. I am just looking for any and all places where the information that he is missing can be reported. For FA here is a reference https://www.facebook.com/furaffinity as for your friend. They should identify themselves. Where did he meet Pulse. How does he know Pulse? How does he know Pulse is the same as the person we are looking for? See what I mean? This friend might have additional info which can be further looked into and more of clue where Darraby is now. Websleuths topic is no longer accessible today. Are there any developments? If I hear of anything in Seattle I'll let you know. With these abduction cases he could be anywhere even though its quite a stretch. I wish him the best and, that he is unharmed. I am the poster from 7:02 yesterday morning. I do not know Darraby or anyone in his friends or family circle, I only saw the case online and am trying to help spread the word. The name "PULSE" was supplied by a person claiming to be his girlfriend on the facebook page linked above. If this information is incorrect, I apologize -I would have thought those who knew him best would give correct information so as to not throw off the investigation. This case is becoming more and more upsetting. 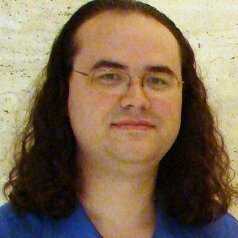 Thanks to anyone who can help find Darraby (he uses a Tiger avatar when posting on other sites, btw). Thanks there. She is passing that information directly on to the family. I too saw her comment about Pulse as she aired it recently on a facebook "Help find Darraby" Thanks there again. so he went off into the woods and was never seen again. So I'm asking is there any news update? Unfortunately, I'm guessing no news is bad news ... on the other hand, there's nothing I can find saying he was found dead, so there's still some hope. According to a post by a relative on the FB page, police have told his parents that Daryn had gone missing voluntarily. Though they appear not to know his current whereabouts, it is assumed he is safe. Gone missing voluntarily and don't know his whereabouts but assume he is safe... that seems like such odd assumptions/conclusions. It seems to me when police say this it's a (excuse the phrase) cop out of searching for them. It typically requires no evidence of motive for foul play, when they see no reason for suspicion they will say that it was probably voluntary so they don't have to search any longer (that and they have probably run out of leads themselves). Basically they are just saying they will no longer actively search for the person. It doesn't really mean that there is a zero percent change that there was no foul play or that they have evidence that they had voluntarily gone missing. It's just there is a lack of evidence that they were taken against their will. If the person has fled voluntarily it would be nice of them to tell someone, however doing so is dangerous to that person being harassed by the people that want them found. It's important for their friends and family to remain vigilant in case a lead does turn up.